Aesthetical tooth restoration with porcelain inlay or composite resin filling. “Invisible” tooth fillings at Dental Planet in Rojales in Spain. Thanks to advanced dental materials, we can carry out tooth decay treatments fast, painlessly and aesthetically. Teeth which are damaged by tooth decay, that do not need a dental crown, can usually be fixed with a dental filling. In doing so, a dentist has to consider the fillings functionality as well as the protection from further tooth decay. He also needs to keep the aesthetical aspect in mind – the tooth filling should not be recognized as such. We usually use one of two methods to treat a decayed tooth: porcelain inlays or teeth fillings with composite resin (a naturally colored porcelain reinforced high-end plastic). 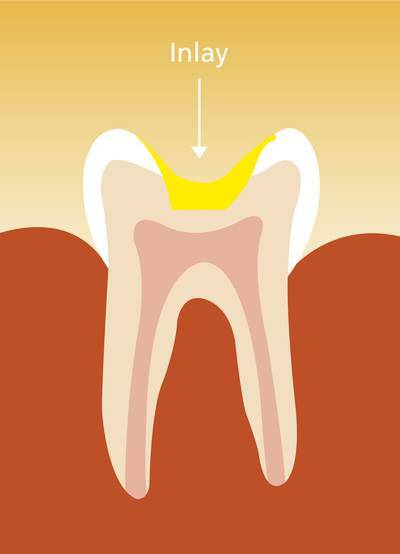 For a caries treatment to be successful, the affected tooth matter has to be removed. In our dental practice we exercise great care to sacrifice as little tooth matter as possible. The modern field of dental medicine allows for non-invasive tooth reconstruction without destroying healthy tooth matter. For smaller tooth defects in the front tooth and the lateral tooth areas we typically use a composite resin filling. Those porcelain reinforced high-end plastics are a very stable and durable material for tooth fillings. However, this method is more time consuming than a conventional filling, as several single layers of this material have to be applied to the tooth. Besides the aesthetical aspect of this method, it has the advantage of keeping marginal gaps to a minimum. With this method almost none of the healthy tooth matter has to be sacrificed - another added advantage. In our dental practice we only work with a very high-end nano-plastic to manufacture tooth fillings. By doing so, we achieve a very durable filling with an outstanding natural look. Dental Planet uses porcelain inlays that can be exactly matched to the natural color of the patients teeth. Porcelain is a metal-free material that can be tolerated by most people, equally as good as gold inlays. Contrary to composite fillings, dental inlays are manufactured in a dental laboratory. At your second dentist appointment the inlay is inserted with a special adhesive into the cavity that needs filling. Inlays are particularly suitable for restoring defects in the side-tooth area where large parts of the tooth matter need to be reconstructed. The damaged or missing tooth matter is replaced with a lifelike reproduction. Many necessary steps must be taken for a porcelain inlay to be accurately fitted to your tooth. That’s why it is very important to work with a dental technician you can count on a hundred percent, as each dental inlay is an individual masterpiece. This sophisticated technique ensures optimal aesthetics and durability. After a porcelain inlay has been inserted it can hardly be distinguished from the natural teeth in which it is set.